Housen's back... like a boss! Synopsis: From atop a building overlooking the Violet Mansion, Yozora Housen (you guys following the manga haven’t forgotten her, right?) reports in to her still unidentified employer. Apparently, things concluded too smoothly and for some reason, Ruka can’t be used for their plans anymore. Ruka's made her choice already. Move on, people. Just move on. Meanwhile, presumably back at her studio, Atsumari asks Ruka if everything is over and she re-affirms her decision to follow the path of being an idol by declaring that this time, she would go all out. 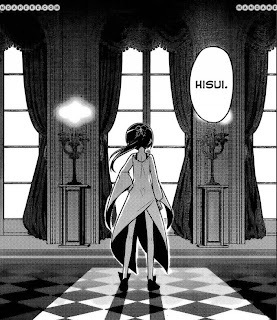 August 14th, back at the Violet Mansion, Nagi reveals to everyone that she would be returning to the Sanzen’in mansion and that she had always planned to do so as soon as the doujinshi competition was over. This elicits some anxious and rather amusing reactions from the current residents of the Violet Mansion who have pretty much made it their home. Hayate chimes in to reassure everyone that nothing would change and that he and Klaus would simply take turns serving as the butler of the mansion (this is the setup that we see in Cuties – which confirms that season to be at least partially canon now along with the non-manga-conflicting parts of CTMEOY). Athena Mini Athena points out that they still need a King’s Jewel otherwise they can’t return to the Sanzen’in mansion. 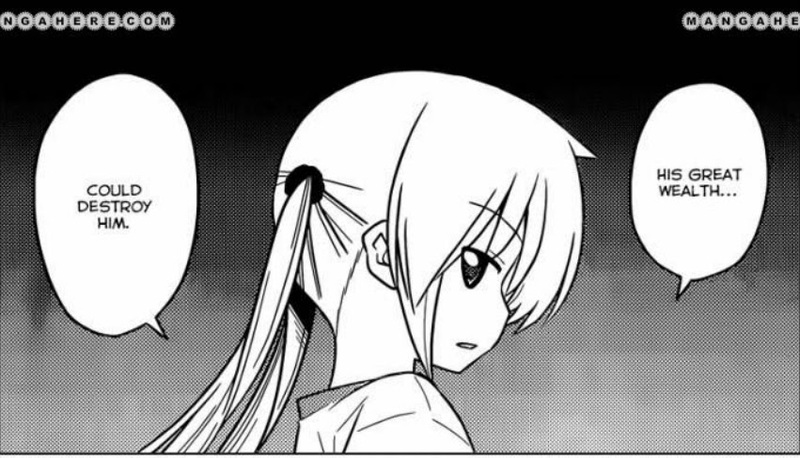 Hayate remembers that Mikado told him that he should know the location of one of them, but he can’t think of anything. However, Nagi is confident that they’d find one of the stones soon and that Mikado would help them because there is one other candidate for the inheritance that he absolutely does not want to give it to no matter what. I understand the symbolism of the mask, but what's with those coffee cans? Back with Housen, we find out that she’s actually a maid for this other candidate – who happens to be Hisui. In case you’re curious as to who she might be, according to discussions from everyone over at Animesuki and RPG dot net, she’s most likely a niece of Sanzen’in Mikado and Jenny’s (Nagi’s childhood friend) sister. Hisui was first mentioned in chapter 384 of this manga. The name totally didn’t ring a bell with me, but that’s what being a lurker comes in handy for. I went ahead and hunted down the panels where she’s mentioned. Review: I was honestly prepared to write a short review for chapter 433 since just like everyone else, I had expected a fanservice beach chapter this week, but what do we get instead *GASP* actual plot development. 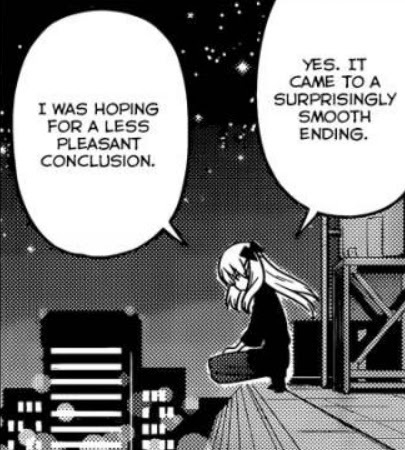 Apparently, Hata-sensei is determined to keep moving the plot along at a steady pace, thus, while there were some light-hearted moments in this chapter, most of it was all business – just setting forth the premise of this new story arc – which we can all expect to be about Nagi getting her inheritance back. Just seeing things through rose-colored glasses, but Nagi looks pretty epic here. 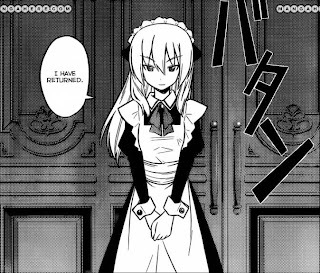 Furthermore, I think it’s pretty much a given now that the events of Can’t Take My Eyes Off You will definitely follow after (and make sense) after this current arc is concluded based on how it’s now been set up how Hayate and Klaus will take turns being the Violet Mansion’s butler. Nagi: Just reminding everyone that I'M the main heroine here. The great thing is that while we do know that Nagi seems to be living a life of luxury again in CTMEOY, we are still unaware of exactly how this came to be. There are so many unknown elements just recently introduced in this chapter, so the journey to getting to CTMEOY promises to be an intriguing one – especially given that this arc appears to be more action-oriented given the presence of Yozora Housen, who, if you guys still remember, managed to hold off both Hayate and Isumi (let’s include Tama as well since he still is a white tiger after all) at once with a smirk on her face. Based on what we’ve been shown so far, it seems that there’ll be no new shipping angles for this new story arc – which I think is a good thing since we pretty much got an overdose of that in Ruka’s arc. Ruka herself will probably be pretty busy with her own concert schedules and won’t feature too prominently in this arc. This might disappoint her fans, but I’m sure she’ll still make an appearance from time to time. In any case, since this arc appears set to advance the main plot and not the romantic subplot of HnG, we can at least expect the passengers of this manga’s ever-conflicting ships to just settle down and enjoy the story for what it is for a while without any heroine-centric whining – unless both Yozora and Hisui somehow fall in love with the oblivious butler, but I doubt that would happen. Can we expect to see Kohaku, Shiki and Arcueid next? Showdown between the battle-ready characters of this manga vs the new bad guys. Hayate, Hina, Athena (teenage version), Isumi vs Yozora Housen and Hisui(?) Not too sure if Hisui is a battle-ready character, but Mikado somehow fears her, at least. 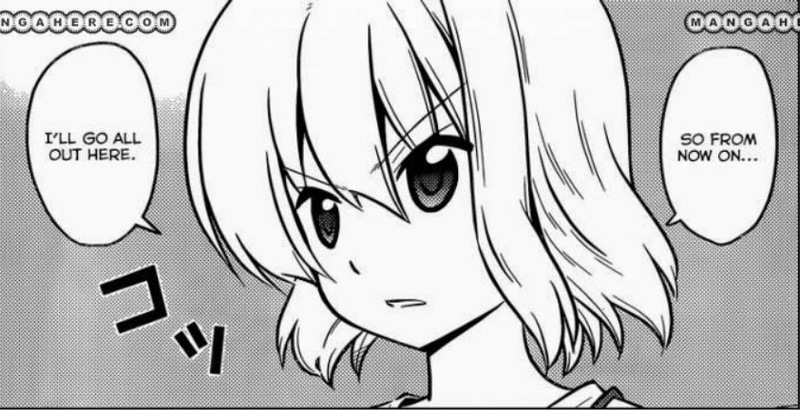 Nagi taking an active role (despite not being a battle-ready character) in this arc instead of reverting to her damsel in distress role from several hundred chapters ago. Hina going for a Wooden Masamune (lol) and Shirousakura dual wield. In any case, this was a pretty awesome way to start off the new story arc. I’m quite excited to find out what Hata has in store for us. How do you guys feel about it? Lemme know in the comments. I'm glad that Hata decided to just move on with the story then have a few gag chapters, which is what everyone expected. 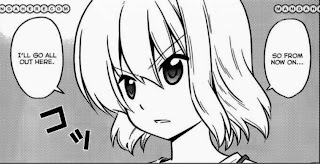 This is also a good way to start making Hayate's brother relevent to the story, because as we know he has Hayate's King's Jewel, which Mikado may or may not know about. While all the shipping aspects seem to be dying down as the series go on, with much more focus on the character growth of the people in it. Overall this was an interesting chapter, moving along the story and introducing the new character Hisui (Who does like a bit like Nagi, with I think a bit of the hamster mixed in personally) I look forward to seeing where this will go next. I think I've got a pretty sound theory for why Athena is currently in chibi mode based on Yozora Housen's message about finding candidates to open the Royal Garden. It might be that Athena temporarily relinquished her memories and powers on purpose in order to prevent Hisui and Housen from using her as a possible candidate. >I understand the symbolism of the mask, but what's with those coffee cans? (1) The end of the doujinshi contest in chapter 429. Pretty awesome, considering how many years passed from Hata-sensei dropping an image of the coffee cans until that actually paid off. >The great thing is that while we do know that Nagi seems to be living a life of luxury again in CTMEOY, we are still unaware of exactly how this came to be. This is the same element that I enjoyed from the doujinshi arc. We knew that Ruka would somehow be out of the picture and that Hayate would be with Nagi, but we didn't know how that would come about. The journey was the fun part, and I think it will be more fun for the "Nagi returns to the mansion" arc (or whatever the arc ends up being called). 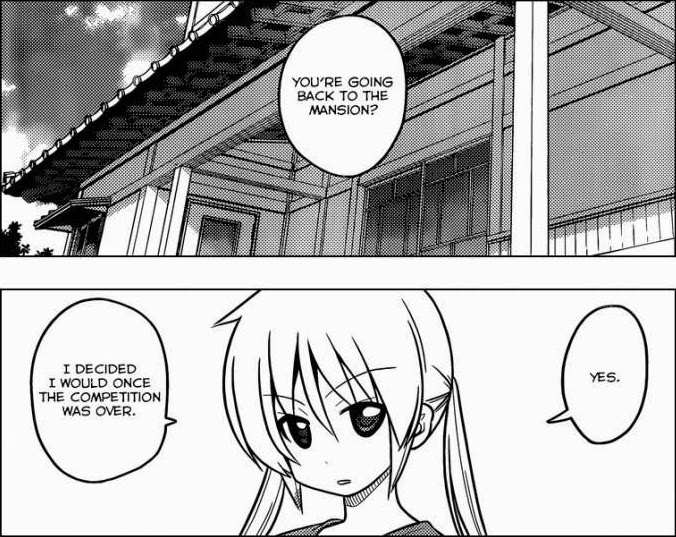 BTW, I see "Violet Mansion" referenced, but I've never seeing Yukari-chan House called that in the manga. Where's that coming from? Re Coffee Cans: Now that you mention it, I think I do remember you mentioning those coffee cans on your blog. I guess those coffee cans symbolize whatever Nagi might have gained at the end of the doujinshi contest? 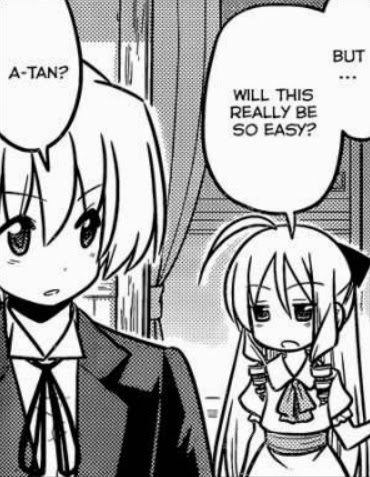 Re Yukari-chan house: The wiki says it's called that in the manga "often." (trivia portion) http://hayatenogotoku.wikia.com/wiki/Violet_Mansion Maybe the scanlators are omitting this when they translate? That reminds me, we still dunno what was up with that coffin in the secret room.